Each year, a collection of documents known as “the Budget” is released with details on the federal government’s estimated spending for the upcoming fiscal year. This practice dates back to the signing of the General Accounting Act of 1921 (Public Law 67-13, also known as the Budget and Accountancy Act of 1921), which created the Bureau of the Budget as well as the General Accounting Office. Each year since then, the president and the Bureau of the Budget (now known as the Office of Management and Budget (OMB)) have submitted a budget proposal to Congress for the upcoming fiscal year. FRASER’s budget proposals and supplemental documents date back to the budget for the fiscal year ending June 30, 1923, prepared in 1922. The Budget documents have varied over time. The main title, Budget of the United States Government, dates back to the origins of the Bureau of the Budget. It is a fairly hefty volume that begins with the president’s budget message, followed by detailed information about the proposed spending and budget details for each agency. The Appendix, published since fiscal year 1952, provides even more detail. The Historical Tables have been published since fiscal year 1986 and are available for several decades. The Budget in Brief (for fiscal years 1951-1990) and A Citizen’s Guide to the Federal Budget (for fiscal years 1996-2002) present budget information in a simplified format, including helpful visualizations. United States. Bureau of the Budget. Budget in Brief (Fiscal Year 1983), page 71. https://fraser.stlouisfed.org/scribd/?item_id=6324&filepath= /docs/publications/usbib/1983_budgetinbrief.pdf&start_page=72. Additional budget documents, including data files, are available from the Government Publishing Office’s website, govinfo, dating back to fiscal year 1996. Budget documents and data from the most recent fiscal year are available on the Office of Management and Budget’s website. Currently, “The Federal fiscal year begins on October 1 and ends on the subsequent September 30. It is designated by the year in which it ends; for example, fiscal year 2015 began on October 1, 2014, and ended on September 30, 2015. 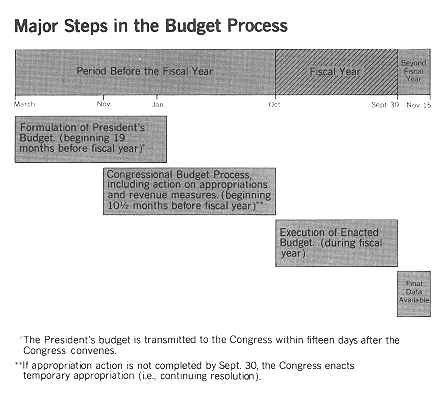 Prior to fiscal year 1977 the Federal fiscal years began on July 1 and ended on June 30. In calendar year 1976 the July-September period was a separate accounting period (known as the transition quarter or TQ) to bridge the period required to shift to the new fiscal year.” United States. Office of Management and Budget. Historical Tables, Budget of the United States Government (Fiscal Year 2017), page 3. https://fraser.stlouisfed.org/scribd/?toc_id=516931&filepath=/docs/publications/usbhist/BUDGET-2017-TAB.pdf&start_page=5. The size of the main budget title has decreased as supplements have been established. The Budget for the fiscal year ending 1923 has 1,056 pages; the Budget for the fiscal year ending 2017 has only 170 pages. The exact date range varies by table; most tables date back to 1940 or 1962. United States. Office of Management and Budget. Analytical Perspectives of the U.S. Government (Fiscal Year 2016). https://fraser.stlouisfed.org/scribd/?item_id=477466&filepath=/docs/publications/usbanalytical/BUDGET-2016-PER.pdf&start_page=2.